Haga que su estadía en el puerto de Puerto Vallarta sea memorable para toda la familia con una emocionante aventura en tirolesa. Vuele a través de la exuberante vegetación de la selva tropical mientras disfruta de increíbles vistas de sus alrededores y vea las montañas de Sierra Nevada de una manera completamente nueva. Esta emocionante excursión en tierra culmina con una breve mirada a la elaboración local de tequila y algunas muestras para degustar. 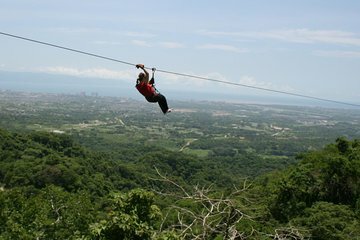 Aventura en la costa de Canopy desde Puerto Vallarta. Todo el equipo necesario y agua embotellada están incluidos. Un representante del tour lo recibirá en su puerto para ayudarlo a encontrar un taxi y responder sus preguntas. The Zip line adventure was outstanding, great fun and above all safe. The guides were excellent and truly characters which made the trip especially fun. We concluded with tequilas tasting which was a added bonus. We did not realize the climbing that is involved with this excursion but the crew was very helpful in making it easier for us. They were extremely thorough in explaining what we had to do as participants and in ensuring that everyone is safe. Guys were very friendly, patient and accommodating - thank you for making it a fun and memorable experience! My Son and his friend can't stop talking about how enjoyable the activity was. Jimmy and Jose made the whole experience very fun! I would recommend going there! Also the tequila tasting was great after, I purchased a bottle to take home for a gift. The zip lining equipment was safe. The views were great and most of all, the guides, especially Abraham, made it great fun. They were humorous while being concerned for our safety. We were picked up in a comfortable, air conditioned van and after the tour given a nice tequila tasting presentation. This company is incredible! My boyfriend and I ended up being an hour late because our cruise ship did not let its passengers off in time. Instead of leaving us behind to miss the tour, the company made sure we were put in a taxi to catch up with the rest of the tour group. This tour was our favorite experience during our time in Mexico! We had a blast with the guys at the zip line. Not only were they hilarious, but they always made us feel safe and taken care of. I've been zip lining in a lot of different places, but this was tour was one of my favorite experiences. I would highly recommend booking this tour! This company was terrific! The guys at the zipline were fun, very friendly and happy to show us a great time. Will go back again and bring friends to enjoy this terrific adventure. It was invigorating and exciting to do the zip line. It wasn't as scary as I thought it would be. The hardest part was hiking to the next platform...some were quite a hike uphill on dirt paths...and in the heat it can take a little effort. Everyone who worked there was great and made us feel safe the entire time. Was an experience to remember. Great time! After the zipline you ride donkey's up a mountian and have the chance to buy photo's for $50 from the trip.